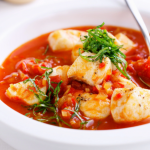 This healthy seafood chili is low in carbs, and keto diet friendly. Made with shrimp, white fish, olive oil, garlic, cilantro, and tomatoes. Very hearty & healthy with a kick of spice. Combine chili powder and 1 teaspoon salt in a large bowl. Rub spice mixture onto fish and shrimp.